A black and white photo of Governor Robert Docking and Robert Kennedy at Kansas State University in Manhattan, Kansas. 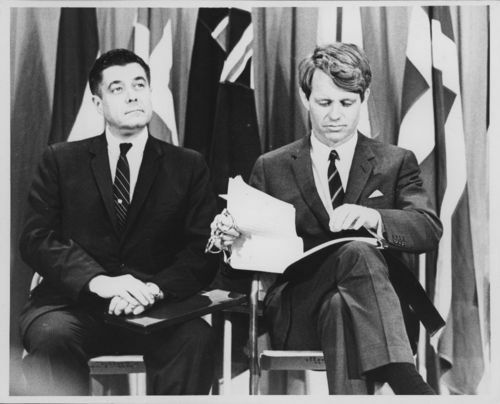 The image shows Robert Kennedy preparing for a speech since announcing his candidacy for the Democratic nomination for the U.S. Presidency. During March of 1968, Kennedy traveled to Topeka, Manhattan, and Lawrence, Kansas, to campaign for the presidential bid. To the left of Kennedy, Robert Docking the thirty-eighth Governor of Kansas, looks on.